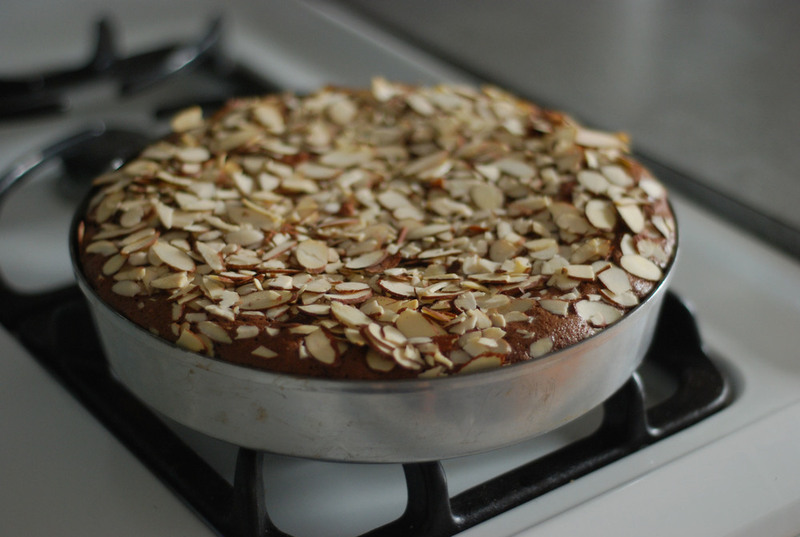 When I post anything on Instagram that has "Gluten free" in the description I usually get quite a few asks on the recipe, this gluten free almond cake was no exception. While I am not a professional recipe tester, I have found an awesome gluten free mix that I can't brag enough about. It's actually from the Huckleberry Cookbook by author Zoe Nathan. I make this in advance and just substitute it for when a recipe calls for regular or cake flour. Grease an 8-inch round cake pan with vegetable spray or butter and flour the cake pan. In a medium bowl, whisk together the cornmeal, gluten-free flour and baking powder and set aside. 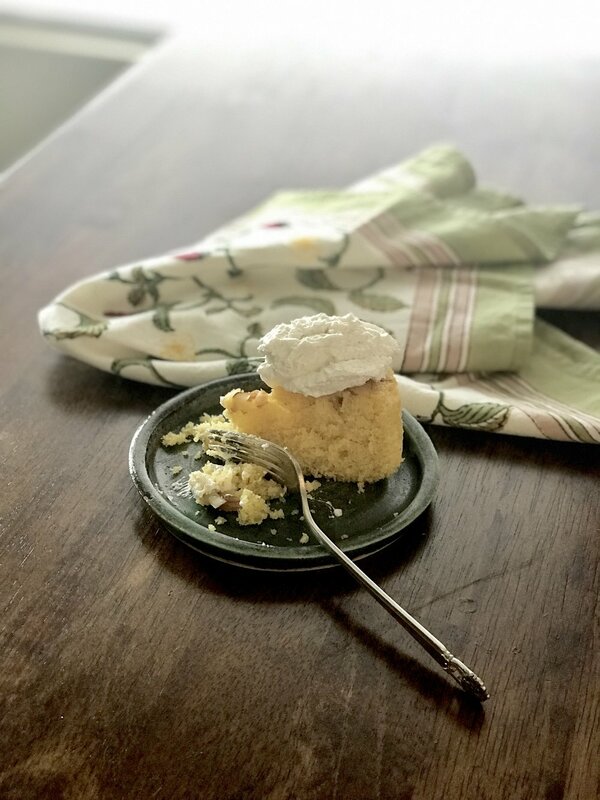 Using a stand mixer with a paddle attachment, I have a KitchenAid, or you can use a hand-mixer, beat the butter and almond paste on high speed until smooth, takes up to 5 minutes. Reduce speed to low and slowly add powdered sugar also called confectioners sugar. Mix until thoroughly combined till it's light and fluffy. Increase speed to high and add the vanilla extract, whole eggs and egg yolks. Add the eggs 1 at a time. Mix until well combined. Reduce speed to medium and add the sour cream and dry ingredients and mix until just incorporated. Pour the batter into the prepared cake pan and smooth the surface with a spatula. I added sliced almonds on top to give the take even more texture. Bake in the lower third of the oven for 35 minutes, or until the cake is golden and pulls away from the sides of the pan. Transfer pan to a wire rack and let cool. Remove from pan and dust with confectioners' sugar if you'd like. Looks fine without it too. I polled my Instagram followers on what topping to put on the cake and well Cardamom Whipped Cream won. I basically whipped up some heavy whipping cream and added some cardamom, a sprinkle of sugar and a dash of vanilla extract until i liked the tasted. It was the perfect compliment to this cake. Posted in Bake, Baking, Food, Sweets and tagged with cake, gluten-free, almond cake, gluten-free almond cake, gluten free, huckleberry. March 6, 2018 by Tanya Ponce. Peaches are in season and once again a friend dropped off a bounty of peaches and plums. I saw a post on Instagram of individual peach tarts and decide right then I was going to make a peach tart. It looked like they may have added a cream to the tart. As live in an almond orchard valley in Central California, you would think almonds would be cheap here, but I've yet to find that. So I decide i was going to figure out how to make almond cream. After a little research I decide to mash up a few recipes to make this delicious Peach Almond Cream recipe. Enjoy this summer delight. 1. Pastry: I use my Cuisinart food processor for this, its the fastest easiest way to make this happen. You could use a pastry cutter and then do a little kneading, into a ball, just be careful to not over knead. For the pastry, place the flour, salt and sugar in the food processor fitted with the steel blade. Pulse to mix the dry ingredients a few seconds and then add the butter (I cube my butter into small pieces with a knife before putting it the processor), and pulse 10 - 12 times. While the motor is running pour in 1/2 cup of ice water down the feed tube. You will see the pastry quickly comes together into a ball. Dump this onto a floured surface and make sure you knead this into a ball, mine just about always is already in a ball, I just pat it together and wrap in plastic and refrigerate for an hour. When ready to use take out of the refrigerator for a few minutes before rolling it out. I roll out the tart out just big enough to fit on my cookie sheet. I use either parchment paper or silicone sheet to line my cookie sheet. Fold over the edges to make a nice crust or leave flat. 3. Add sliced peaches in a few rows. Be creative on how you want them to lay out. I like them in long rows. 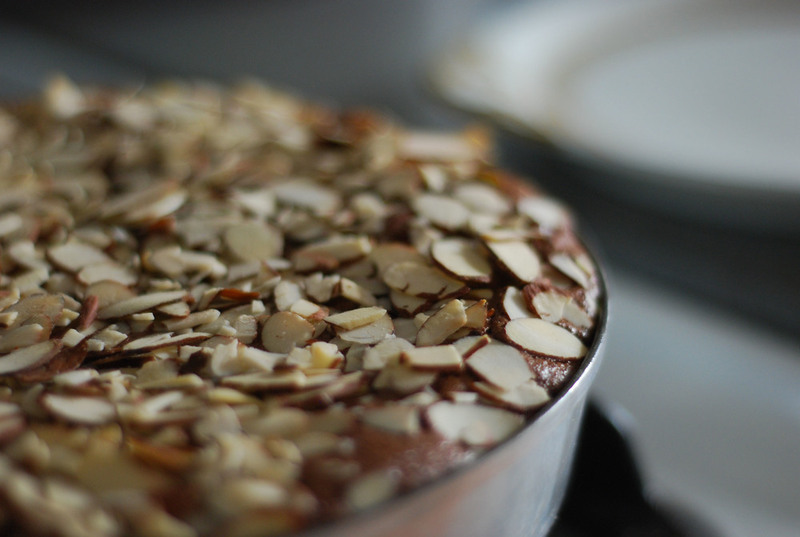 Sprinkle with the Turbinado sugar and almond slices and put in the oven. Bake for 45 minutes to an hour in a 400 degree oven. Cool, slice and EAT. Posted in Bake, Baking, Food, Sweets and tagged with Bake, almond, almond cream, peach, peaches, peach almond cream tart, tart. June 28, 2017 by Tanya Ponce. Candied grapefruit, doesn't that just sound delectable. Well in my quest to make a refreshing cocktail, I thought about what would I garnish it with. Since the major citrus ingredient in my cocktail was grapefruit, why not use the peels for something extra sweet and special. Cut peel from grapefruits into strips or small triangle pieces, you can leave about 1/4 of the white pith. Place the peels in a small saucepan, add cold water to cover over them. Bring water to a boil, then drain; you will need to repeat this process twice. These are great as garnishes to a drink. I might dip a few in chocolate next, because everything taste better in chocolate. Posted in Food, Make, Sweets and tagged with grapefruit, candied grapefruit, cocktail garnish, candied grapefruit peels, peels, candied peels. May 2, 2014 by Tanya Ponce. That has to be the longest title ever, but there is so much to say about these brandy infused chocolate truffles that I rolled into shredded coconut, OH MY! This recipe is adapted from Alton Browns recipe on Food Network. I made these for my friend Deborah's photo styling project, here, but of course was able to sample a few myself before delivery. Here's the recipe and my notes. Place finely chopped chocolate and butter in a glass mixing blow and mircrowave for 30 seconds. Remove, stir and repeat the process one more time. Set aside. Heat the cream and corn syrup in a small saucepan over medium heat until simmering. Remove from heat and pour the mixture over the chocolate, let it stand for no more than 2 minutes. Stir gently with a rubber spatula until smooth and creamy. Here's the boozy part, pour the 1/4 cup of brand into the mixture and stir. You can pour the mixture into a square glass backing dish or leave it in the glass bowl and refrigerate for 1 hour. For rolling out the truffles I'd suggest using a small ice cream scoop. I used and melon baller and it was hard to get the chocolate out of the baller (is that a word, well it is now), so I switched to a small teaspoon and used my warm hands to roll the truffle balls. Next time small ice cream scoop like this one from Target. Once formed you can roll them in the cocoa powder if you want them covered only in that, but I opted for rolling them in shredded coconut. Let me tell you the texture and brandy taste is exciting and surprising. Enjoy! Posted in Baking, Bake, Food, Sweets and tagged with brandy infused chocolate truffles with coconut, shredded coconut, brandy infused chocolate truffles, truffles, chocolate truffles, chocolate, brandy chocolate. March 5, 2014 by Tanya Ponce. You know when you stumble upon something great and you didn't even plan it. Well today was one of those days. I started off on the trek to Muji in Hollywood, which isn't really that far away, but in L.A. traffic it can be an eternity. So on my way I saw that the La Brea Bakery was open. 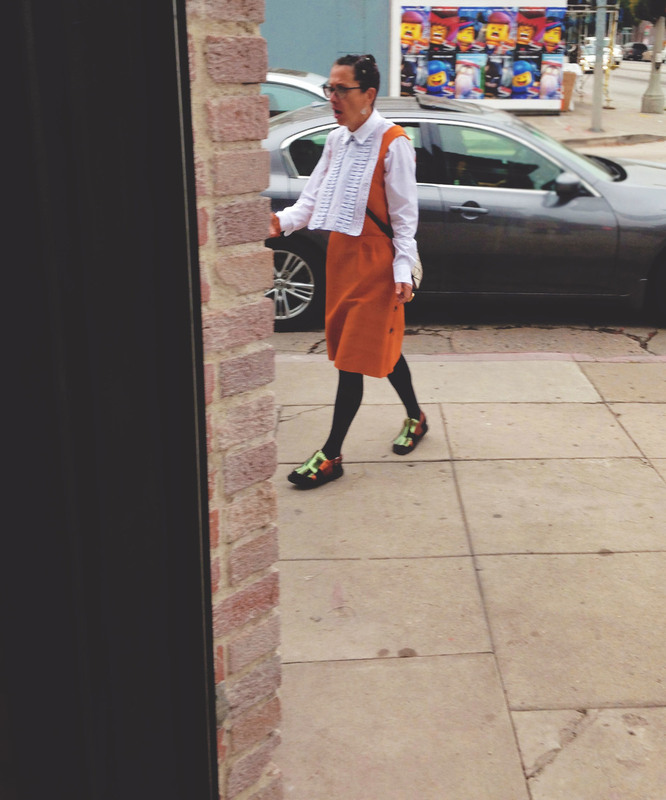 I had read that Nancy SIlverton was opening up this bakery 25 years after she started this business. She owns two other restaurants, Pizzaria Mozza and Osteria Mozza. Both on my list of favorite places to eat in Los Angeles. Not to mention all the awards she has one, just go look her up on Wikipedia, she's amazing. So I made a mental note to stop by on my way back. And glad I am. Little did I know that today was the GRAND OPENING. Seriously my timing was perfect, well almost. I saw people coming out with bags of baguettes, jumping for joy and super full of from all the goodies they had partaken. Funny thing is I only really wanted a cup of coffee, that wasn't Starbucks, and a french baguette. What I got was passed around delicious pastries and this was before I even ordered my coffee and was urged on by the staff to try all the other goodies. Can you just say SCORE!!! Only thing I missed out on was the free baguettes, they had all been given to the press before I got there, so close, yet so far. How can I get my a blogger press pass? Nancy, George anyone? Oh yeah George, met him, he has worked for Nancy for 20 years. They are very good friends. I love meeting people like this. He told me of the story when he first started working for her, it was a "bring your kids to work" day. So he put them on a stool and showed them how to work the cash register. Oh to be a kid in a bakery with a world class bread and pastry chef for a mother....what a dream. What I got was the lead image above, a Chocolate Eclair, so amazing. I can't wait to go back. That was followed up by a Sunshine Twist (with light glaze and orange zest), a Fleur Macaroon, that was an unbelievable surprise of flavor, a Brownie that I think melted in my mouth, a Pine Nut Macaroon, and an Almost Oreo cookie. Those were just the sweets. 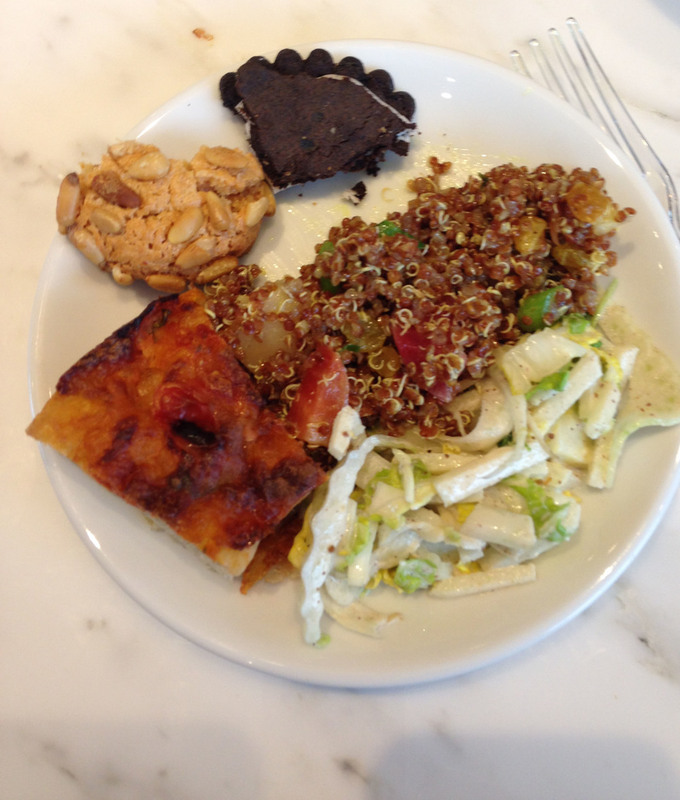 I did get my Cappuccino, and also sampled the apple fennel salad and red quinoa salad along with a slice of artisan pizza. I watched these guys above make pizza, they were so patient with the dough that just looked so soft and perfectly made. I got to talking to them and they are only 2 weeks into the job, making some amazing creations. Working with guys who have been making pizza's since they were 16. I can't wait to come back. Here's the best part it was all free. Since it was the grand opening they were giving everyone free samples of there food. SCORE!!! Nancy was there, but I just missed her, though I did take a picture of her fleeing the scene. And one more bonus, just as I was driving away I caught the entire staff and owner cutting the ribbon. I laughed all the way home. If I had planned this out, it would have never happened so well. I told all my friends about it tonight, I've already got converts and an excursion planned to La Brea Bakery this weekend. 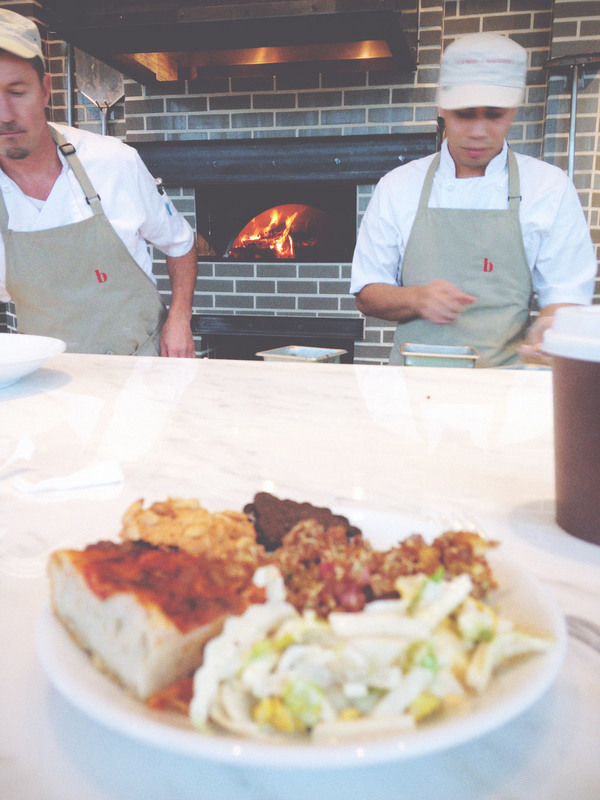 Posted in Bake, Baking, Food, LA Local, Sweets and tagged with La Brea Bakery, Grand Opening. January 31, 2014 by Tanya Ponce. Believe it or not I've never made sugar cookies. 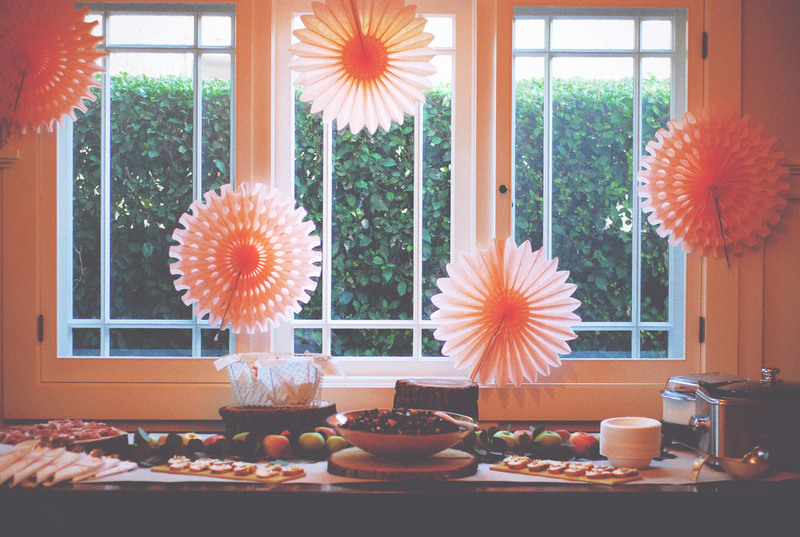 But we decided we wanted to do this for the party, it sounded like a nice Fall goodie. I went searching online and texting a few friends that have made them before to get ideas. I finally settled on Food52's blog. With a cute Acorn cookie cutter provided by Bake It Pretty and an awesome Sugar Cookie recipe from Food 52, these were some tasty goodies!!! 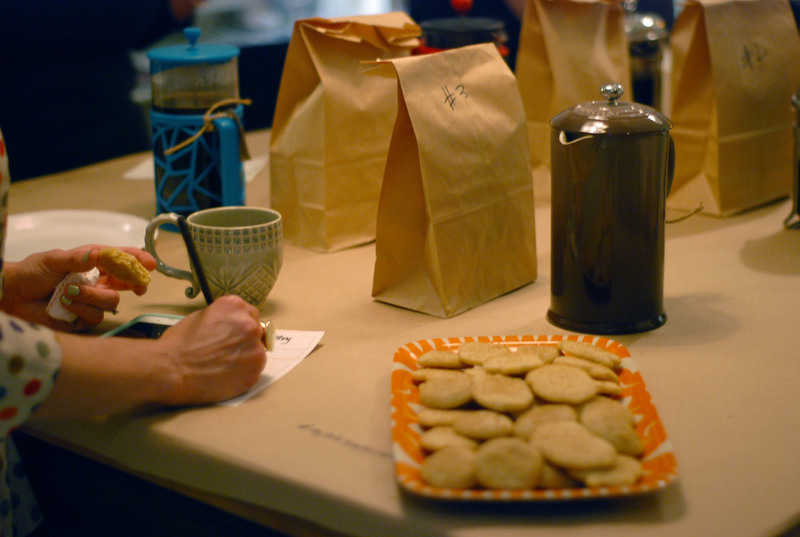 They ended up being THE palate cleanser for the coffee tasting, not intentional, but who doesn't like a good cookie with their coffee. Stephanie pictured below, with cookie in hand, would agree!!! To me what makes the Food52 sugar cookie recipe so good is the three different types of sugar you put in them. White and brown sugar for the dough and rolling it in turbinado sugar just before baking. The only adjustment I did for this recipe was add 1/2 cup more of flour. This was because I knew I'd need to roll the dough to cut the shapes out. I might add a little more next time as it was still hard to roll out, but that might have been better, you really don't want to over work this dough. Posted in Bake, Baking, Food, Sweets and tagged with sugar cookies, bake it pretty, food 52. This past weekend two of my fellow bloggers and Alt Summit attendees planned a Fall tasting event called My Life Simply Sweet. This week we will be sharing all the festivities from the event, which included our first ever Coffee tasting with Stumptown Coffee Roasters as our sponsor mixed in with a few local roasters in the L.A. area that I gathered up. You'll also see a recipe for another easy appetizer, as seen below. Now let me introduce you to these ladies, first up is Felicia, a wife and mom of one, from A Simply Raw Life. 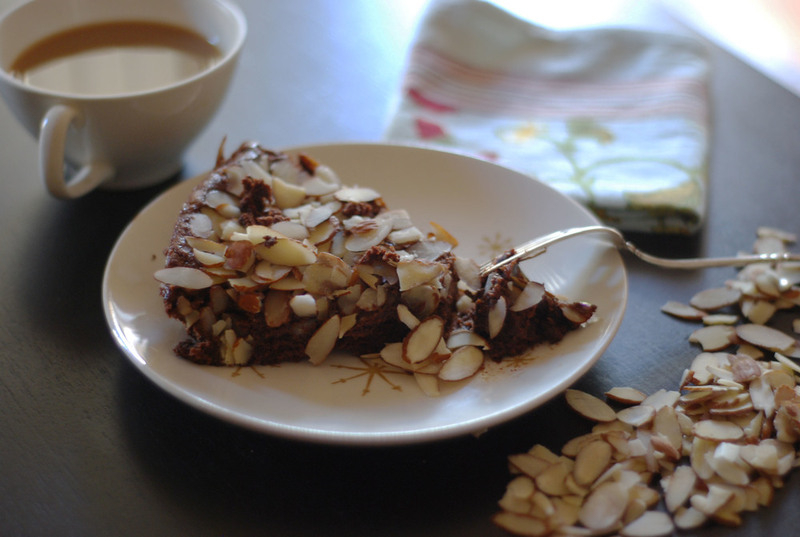 Felicia features wonderful raw food recipes from smoothies to desserts to just about anything you can think of in the raw food category, and let me tell you her food is delicious. This week she'll be sharing her recipe's made from the great sponsors and products of Artisana Foods, Manitoba Harvest and Navitas Naturals. Check out her blog this week for those post and make sure you click on the links for these goodies: Green Smoothies and Raw Chocolate Tartelettes. 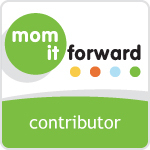 Deborah from My Life at Playtime is a wife and mom of 3, who shares all her family adventures, art lessons, diy decor and handmade goodies. She lent her lovely home for this event and will be sharing a few posts sponsored by Minted and Bake It Pretty. You'll get to see the details on how to make the garland and body butter below. She might even share her first time making cream cheese frosting for her pumpkin muffins. Together with It Sweet & Savory we hosted this lovely event we called My Life Simply Sweet, get it? It's perfect for us. Check out our hashtag on Instagram and just about every other social network this week as we share the details #mylifesimplysweet. And doesn't that table garland below just scream Fall, look for that this week on Deborah's blog. Image above courtesy of Deborah. Posted in Food, Baking, Life, Play, Sweets, Things and tagged with mylifesimplysweet, fall tasting, minted, manitoba harvest, navitas naturals, artisana foods, stumptown coffee roasters, bake it pretty. November 4, 2013 by Tanya Ponce. During the Fall apple season I usually make tarts or turn-overs. And believe me I will. You can see a few of my past posts on these recipes. Tart + Turnover . I tried both a sugar glaze and sprinkling on the powder sugar. I think I prefer the powdered sugar. Either way you might like this baking/frying alternate to apple season Here is the Pioneer Woman's recipe. Enjoy! Posted in Bake, Baking, Food, Sweets and tagged with apples, apple, fritters, apple fritters. October 18, 2013 by Tanya Ponce. Garbanzo beans, really? I know your going to ask that, I did when my friend Karen shared this recipe with me. These are pretty scrumptious cookies and they are gluten-free. Mine don't look as good as Spry's, but they tasted YUMMY. Even the dough before it was cooked was yummy. Go ahead, give it a try, I swear if you like peanut butter, honey and chocolate chips, you'll really like this one. Posted in Bake, Baking, Food, Make, Sweets and tagged with gluten-free, garbanzo beans, chocolate chips, peanut butter, cookies. October 9, 2013 by Tanya Ponce. I think I might be slightly obsessed with blueberries. While I normally buy them fresh, especially when they are on sale, we also buy wild frozen blueberries from our favorite store, Trader Joes. We keep these in our freezer for making shakes or defrosting to put into yogurt and now for mini blueberry pies. I got this recipe from a recent Bon Appetit , I keep challenging myself to make a least one of the recipe's in their magazine, sometimes more come out of it. I'm the dessert maker, SB finds all the savory ones to make. Here's the recipe I used and well the image above is inspired by Bon Appetit too. Use a food processor, if you don't have one use a pastry blender. Pulse the flour, sugar and salt in the food process and in add in the butter. Pulse until the texture looks like coarse meal. Add 1/4 cup ice water, pulse. Add more water if it's till dry. Dough needs to come together in clumps. Form into a square (this makes it easier to roll out the rectangle. Wrap in plastic and refrigerate for about 2 hours till it gets firms. Let it stand to room temperature for 15 minutes before rolling it out. Roll out dough on a floured surface into a large rectangle. Cut into 6 rectangles. If there not perfect, embrace it, these are handmade and should look like it. Mix berries with lemon zest, lemon juice, sugar, and salt in a medium bowl. Brush edges of rectangles with water; (I used my fingers dipped in the water, it's faster for me). Place about a tablespoon and half of blueberries in center of each rectangle (may use more or less, depending on how big the piece is.). Fold dough over, and press edges to seal. 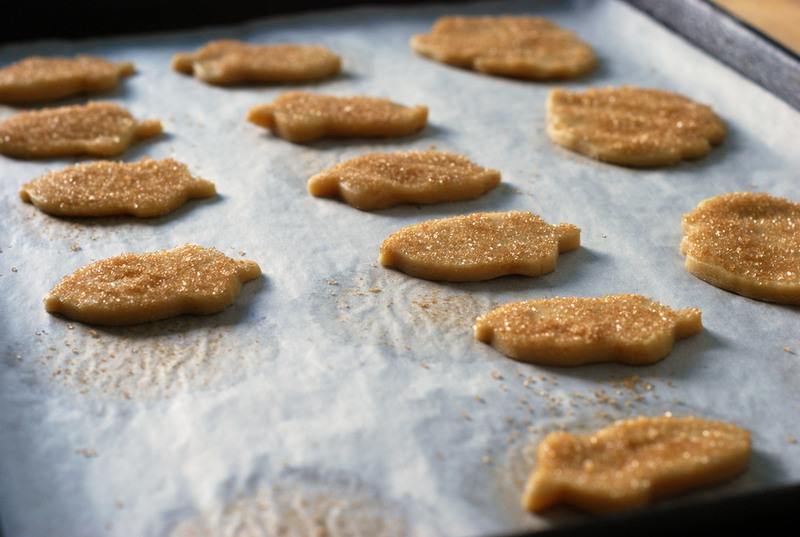 Place the six rectangles on a parchment-lined baking sheet, brush with egg wash, and sprinkle with raw sugar. Cut slits in tops. You can see i should have cut more slits, but it still turned out yummy. Bake mini pies for about 35-40 minutes, rotate sheet halfway through, until juices are bubbling and pastry is golden brown (be warned the juices will run onto parchment). Let cool slightly, these can be served warm or at room temperature. Posted in Bake, Baking, Food, Sweets and tagged with blueberry, blueberries, blueberry mini pies, pie, pies, bon appetit. September 17, 2013 by Tanya Ponce. I get so inspired by all the great photo's and blog post and especially about making things gluten-free. I tolerate gluten, but feel better when I don't partake of it. I saw this recipe and knew I had to give it a try. I still haven't been brave enough to try the vegan route...i just can't give up butter. This cake is really moist and very yummy. Give it a try. Zest of 4 lemons, if you want in more lemony taste you can squeeze a little lemon juice, but this is already a very moist cake so be warned. Original recipe called for 1/4 cup lemon zest which can be about 6 lemons. Preheat oven to 325. Butter 8-9 inch cake round, I use parchment paper on the bottom and also butter that, it makes it easier to get the cake out of the pan. I used my KitchenAid stand mixer, but you can also use a regular beater. Mix softened butter, 1 cup of sugar, lemon zest, vanilla (either extract or vanilla seeds from the bean), until its pale yellow and creamy. I did this for about 6 minutes (thus why i like to use my KitchenAid stand mixer). Add in the separated egg yolks one at a time, that is if you didn't already blend them all together, in that case just drizzle egg yolks in a little bit at a time. You'll need to scrape down the sides of the bowl through out the process. Mix in the Almond Meal. Scrape down sides and take bowl from under mixer and fold in the Ricotta. In a separate bowl mix the egg whites until white and fluffy, slowly pour in the 1/3 cup of remaining sugar until it makes glossy soft white peaks. Gently fold in 1/2 the egg whites, you want to make this a lite and airy cake, finally fold in the rest of the egg whites. Pour mixture into cake pan. 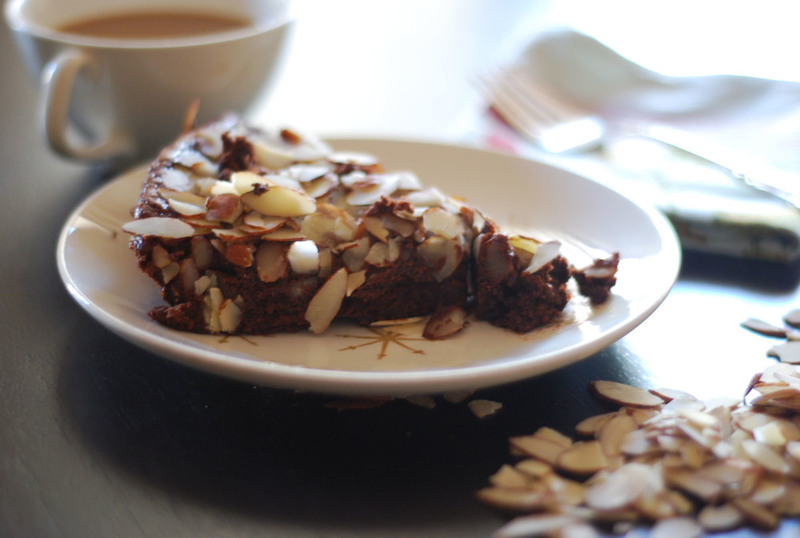 Sprinkle almond slices over the top, I covered mine as much as possible. Put in the oven and bake for about 45 minutes. May need more time, I think I added about 8-10 more minutes to this, but test center with toothpick to make sure it comes out clean and the cake is fully baked. When you pull it out it look like a fluffy cake, once it cools down it deflates a bit. After it cools down dust with powdered sugar and serve. With coffee is great. Posted in Bake, Baking, Food, Make, Sweets and tagged with cake, dessert, gluten-free, almond, lemon, ricotta. August 23, 2013 by Tanya Ponce. A few years back I made the peanut butter chocolate kiss cookies above. I find this is still a go to recipe I use all the time. In fact it was just over 4 years ago, July 15, 2009 last time I posted about it. We have an annual 3 day convention we go to every year and well I find a little treat and pick me up in the afternoon is just the thing to help me pay attention. I've adapted this recipe from a local small town Iowa cookbook. It's super easy and a great idea for something to do with kids. They can unwrap all the kisses and help put them on the warm cookies as you pull them out of the oven. After you mix all the ingredients start hand rolling the dough into small balls. Roll the balls into sugar and lightly coat. Place the rolled cookie dough onto cookie sheets and cook at 375 for 8 minutes. Start unwrapping all your chocolate kisses while you wait for the cookies to bake. After first 8 minutes, take out the cookies and gently smoosh one chocolate kiss in the middle of each cookie. Then return to the oven and finish baking for 5 more minutes, then let them cool on a rack. Then eat away, Enjoy! 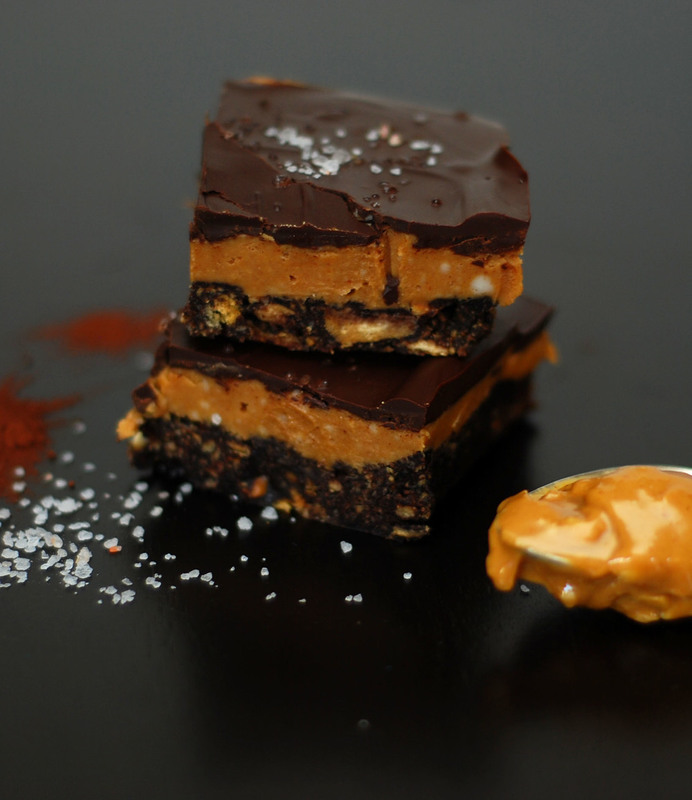 1 c. Peanut Butter (I use Trader Joes or a Natural Peanut Butter, I've used Skippy before but i like a little more texture in this recipe). Directions: Cream butter, peanut butter, sugar and brown sugar; add eggs, milk and vanilla. Sift together dry ingredients, except additional sugar and candies; add to butter mixture. Shape into balls; roll in sugar and place on cookie sheet. Bake at 375 degrees for 8 minutes. Remove from oven and press and chocolate star or kiss on each cookie until the cookie cracks around the edge. Return to oven for 5 minutes. Posted in Bake, Baking, Food, Sweets, Make and tagged with chocolate kiss cookies, peanut butter, peanut butter chocolate kiss cookies, chocolate kisses. July 23, 2013 by Tanya Ponce. On one of my farmers market runs I went to get peaches and came back with not only those, but quite a few other stone fruits. This included nectarines and pluot's. The later I had never had, but wow were these sweet and juicy, bursting with flavor. I had to get a few. I came home right away sliced and ate em. Every once in a while I find a new blog, to me, or a new food show, this time I found both. The Pioneer Woman. Ree Drummond is just so REAL, I would love to meet her in person. She has a great recipe for what she called a "Crisp." Only she made hers with peaches. I decided to combine my farmers market peaches, nectarines and pluot's that I still had on hand and put them in a baking dish below. Have I ever mentioned that I someone how always pick the HOTTEST most HUMID day to bake and at the time of day that the sun is beaming into our little apartment. Well I do, at least the house always smells good, that's my excuse to SB. To make the topping, in a separate blow mix 1 cup flour, 1/2 cup of sugar, 1/2 cup of light brown sugar, 1/2 tsp cinnamon, 1/2 tsp nutmeg, 1/4 tsp salt and cut in 1/2 cup cold butter. Either do this with a pastry blender or a good old fashioned fork. I've done both, but prefer my pastry blender I got from Sur La Table a while back, this one. Fully cover the fruit and pack down lightly. Cover with tin foil and bake in a 350 degree oven for 15 minutes. Uncover and bake for another 20-30 minutes until crunchy on top. I have gone the full 30 minutes to make sure it's nice and crunchy. You can serve this with vanilla ice cream or vanilla Greek yogurt. I've done both and was happily content. It's a great recipe, tested on myself and then on my friends three kids, it's a hit. 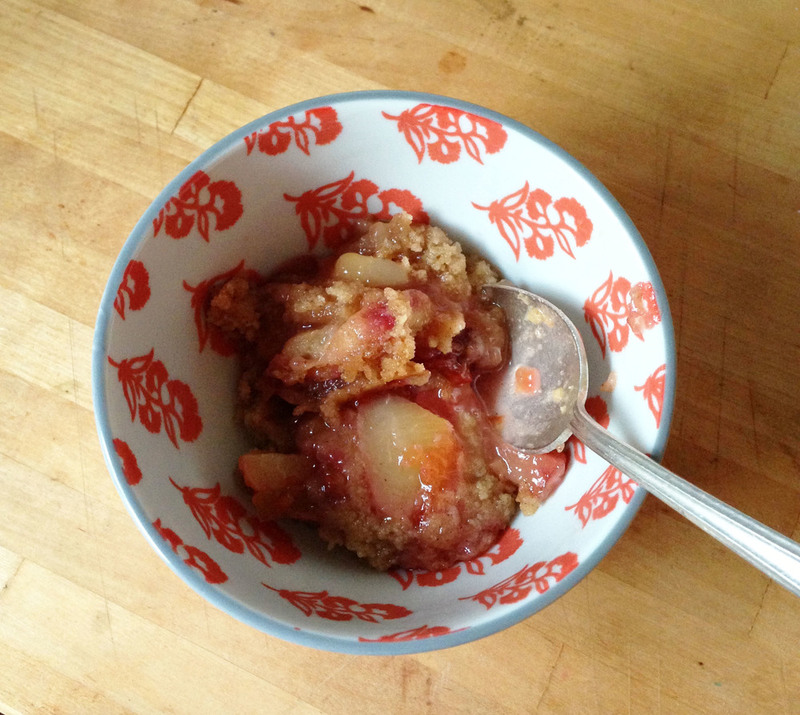 Use whatever stone fruits you have on hand. Peaches are everywhere now, so take advantage of the deals and the amazing juicy fruits. Enjoy! Posted in Food, Bake, Baking, Make, Sweets and tagged with stone fruit, peaches, pluots, nectarines, farmers market. July 18, 2013 by Tanya Ponce. Last week when visiting our Ugandan family, they sent us off with a bag full of mango's and avocado's. All of them were ripe so this past week I went to making anything I could with these mango's. Their in season this month. I think spring and summer fruit is my favorite, so excited about what's popping up at the farmers market these days. 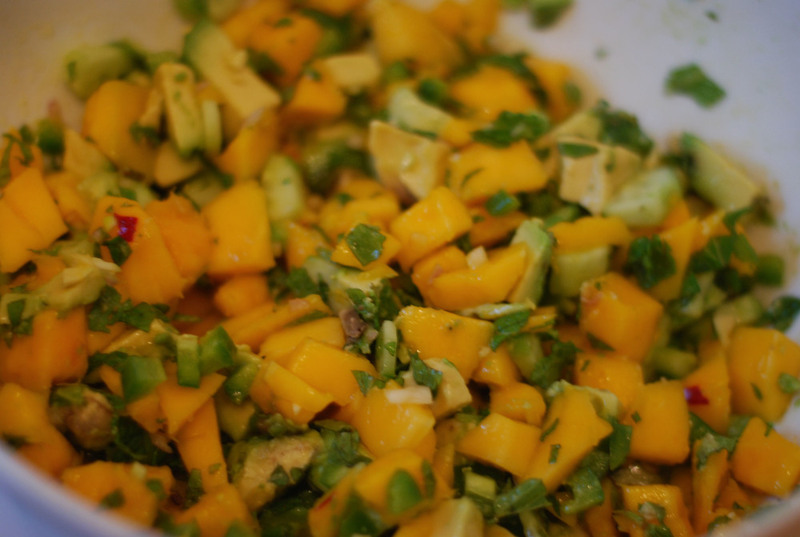 I had decided first thing to make was mango salsa. So I started off with my favorite ingredients, mint, jalapenos, cucumbers, lime juice, shallots and of course olive oil and salt. I finely chopped the mint, shallots and jalapenos (take the seeds out). Cucumbers and avocados I left in chunks. Pinch of salt to taste, some lime juice and olive oil to finish it off. This was delicious, spicy and juicy. Mango and mint is a great combination. I like the cucumber for some extra crunch. Serve with Salmon, a cheese quesadilla, chips, or whatever you fancy. 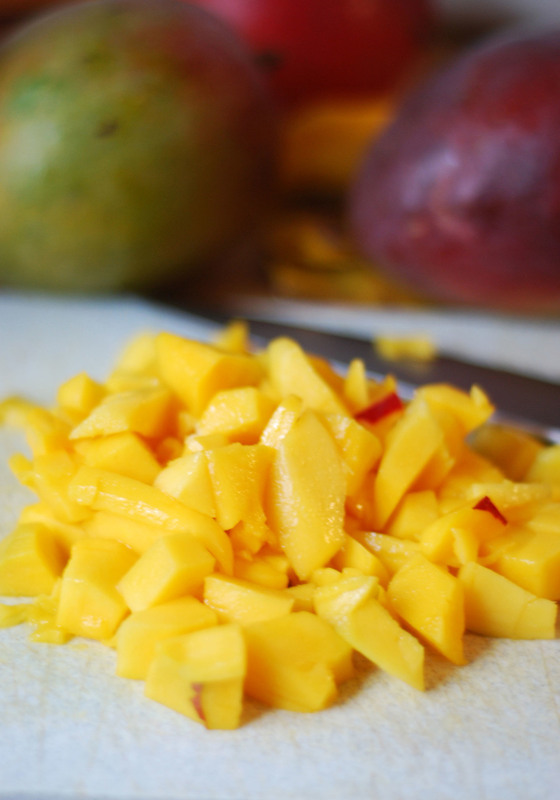 Do you want to know the best way to slice a mango? Slice the bottom of it so it sits securely on a cutting board. Then with a sharp knife slice off the skin. Finally take big slices all around the seed. Then it's up to you how to chop it. I made chunks for the salsa, but if you want something fancy you can do nice thin slices too serve for breakfast, with vanilla yogurt would be awesome. Next up was Mango sorbet. I used mint in mine, but the recipe I found in my new David Lebovitz The Perfect Scoop: Ice Creams, Sorbets, Granitas, and Sweet Accompaniments ">Perfect Scoop cookbook left the mint out. 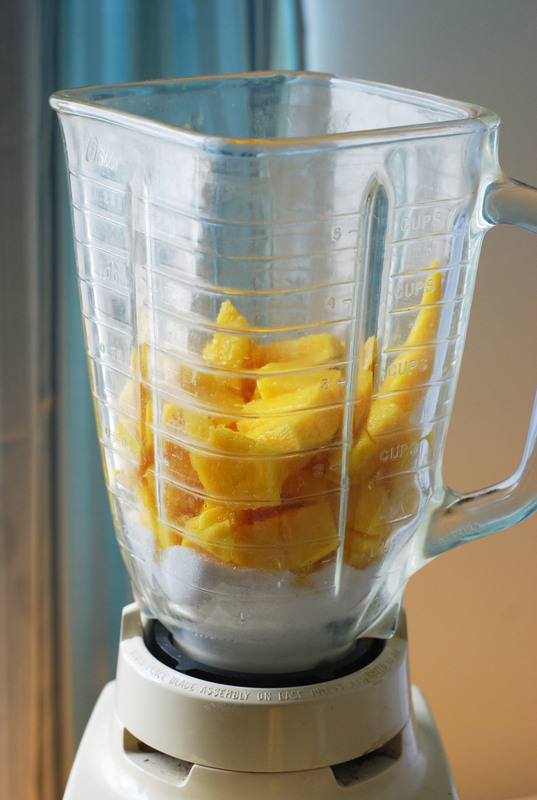 I swear that blender is 18 years old and still working. For this receipe I used 2/3 cup of sugar, 2/3 cup of water, mint, squeeze 2 limes, 1 Tbsp of dark rum, and pinch of salt. Blend ingredients and then chill for a couple of hours. Put chilled ingredients into your ice cream maker and follow instructions from the manual. Bits of mint and skin (probably better not to have the skin, but it still taste good. Refreshing mango mint sorbet, such a good spring dessert. Enjoy! Posted in Food, Make, Sweets and tagged with mango sorbet, sorbet, perfect scoop, mango salsa, mango, salsa. May 7, 2013 by Tanya Ponce.